Please recall that Nancy Pelosi promised Americans that Obamacare would save you and me $2500 per year on our health insurance premiums. It didn’t. Premiums went up by that amount, not down. She missed the mark by $5000. Chump change to a limousine liberal like Ms. Pelosi. Now she characterizes the Republicans tax plan as theft because [drumroll!] it lets Americans keep more of THEIR OWN MONEY. Leftists like Pelosi consider your individual productivity as being owned by the state, not the individual. Leftists like Pelosi have remarkable chutzpah. They have no shame in lying. Eighty-percent of taxpayers will see their taxes lowered. Lower income families with children may actually get a check from the state! Ms. Pelosi considers this theft. There are legitimate pros and cons to the Republican plan, far more pros than cons in this humble blogger’s estimation. The likes of Nancy Pelosi and Chuck Schumer, however, insult our intelligence with their hysterical put down of tax reform that so many of their caucus had previously supported. 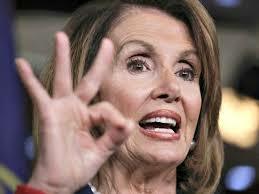 It is hard for Nancy Pelosi to outdo herself, but I do believe she has succeeded. Nancy Pelosi refuses to acknowledge that Jesus had a right to life. Merry Christmas! Sadly, she gets away w/ this nonsense b/c the left has redefined terms and so much of our population don’t know the meaning of words. The amazing thing about our language is that words mean a pretty specific thing, but so many now only know the emotional definition of words as they’ve been redefined by the left. Now it’s all about what things SOUND and FEEL like and not reality. The knee jerk reactions of so many are the programming of the left. It takes real effort to hear what was said and not what it “FELT” like to hear it. Great quote from the controversial Mr. Sobran.